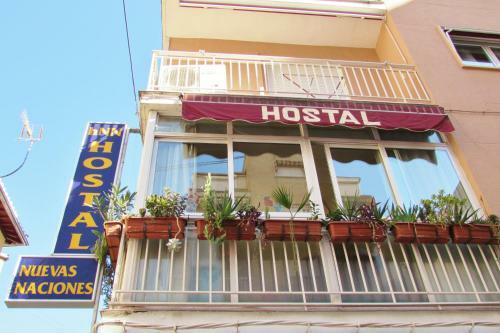 Situated only 10 minute's stroll from Granada Train Station, the Hostal Nuevas Naciones Granada offers family/oversized rooms, air conditioning and a 24 hour reception. Found in the popular Centro, the hostel has easy access to many dining and entertainment options. Amenities at the hostel include a tour desk, luggage storage and a safe. Rooms at the hostel are equipped with radios, showers and TVs. A desk with an electrical outlet and a private bathroom can be found in each room of the hostel. The Hostal Nuevas Naciones Granada's district is known for its nightlife and you'll be spoilt for choice deciding on which place to go. For those guests who want to enjoy a drink and sports close by, conveniently there is also a sports bar. For those guests who want to enjoy a drink and sports close by, conveniently there is also a sports bar. The hostel is a 10-minute walk from the Madrasah of Granada, and an easy drive from Monachil. Under a 20-minute drive away, Federico Garcia Lorca Airport (GRX) is easily accessible from the hostel. This hotel is 1804 metres from the Alhambra entrance, 762 metres from Plaza Nueva (the absolute centre of Granada), 832 metres from the train station and 2249 metres from the bus station.